What would you do to try and win the heart of your desired crush? For Conor (Ferdia Walsh-Peelo) he has to quickly assemble a band after offering model Raphina (Lucy Boynton) to appear in a music video. He also has to deal with his family falling apart in front of him. Luckily for him- and the audience- Conor's passion for music leads him through this tough time in his life. Director John Carney is back again creating yet another small musical drama with comedy being a big feature within the film similar to the likes of 'Once' and 'Begin Again'. Carney clearly has a knack for this genre as he combines the elements of the three genres fantastically well. 'Sing Street' is one of the biggest surprises of the year for sure. A truly charming and fun film throughout that sadly doesn't seem to be doing too great at the box office. Hopefully when it is officially released worldwide, it will sky rocket. If you get the chance to, go and see this film! For a film to be a musical, it is a no brainer that the music has to be up to standard. 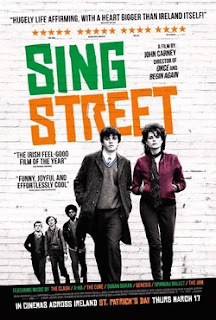 'Sing Street' exceeds this with phenomenal tracks from the likes of The Jam and The Cure. Amongst these are some fantastic original pieces of music that will be stuck in your head for days. The song 'Drive It Like You Stole It' from the band's performance is great and will be one you'll be adding to your playlists very soon. The music in the film is also spread out very well. As the band progresses and get more experience playing together, the music does improve. You can see a growth in the talents of the band from this and is done very well so it is not like they have always just been fantastic and don't improve. The music is a huge part of the film obviously due to being the main part of the story. Not only is the actual music in the film very good but the film also shows the effect of music incredibly well. The likes of how a new kid at school can instantly make friends due to having the same passion for an art. Also how someone may be down on their luck and not have much going for them, they are style kept happy in life by their favourite records. The film shows that music is great for people and how to some, it really means a lot more to them than anything else. The film is also delightfully funny throughout the whole film. The young cast deserves credit for this as they pull off the jokes very well with great comedic timing. The film also uses a good combination of visual jokes along with verbal throughout the film to keep it fresh. A lot of the enjoyment for me personally with the humour came from the band's first attempts of making a music video as they all show up in different gear, all fitting to the setting of the 80's. One of the funniest films of the year although it isn't a complete comedy. 'Sing Street' carries quite a bit drama throughout the film as well, all working to great effect. Scenes where certain characters have trouble dealing with situations are pulled off by good work from the cast and also due to how the story makes you care for the characters. The dramatic scenes don't seem forced and have good effect on the film showing that not everything in life is going to be as perfect as you think and how things may not go to plan. At times throughout the film, things do move a lot quicker than it realistically would. This happens in a few situations throughout the film but it really isn't a big problem to the film. This is the only problem I had at times with the film but it does not affect the viewing experience at all. A great musical drama with great moments of comedy throughout. You'll love the soundtrack as well as the characters in this one. 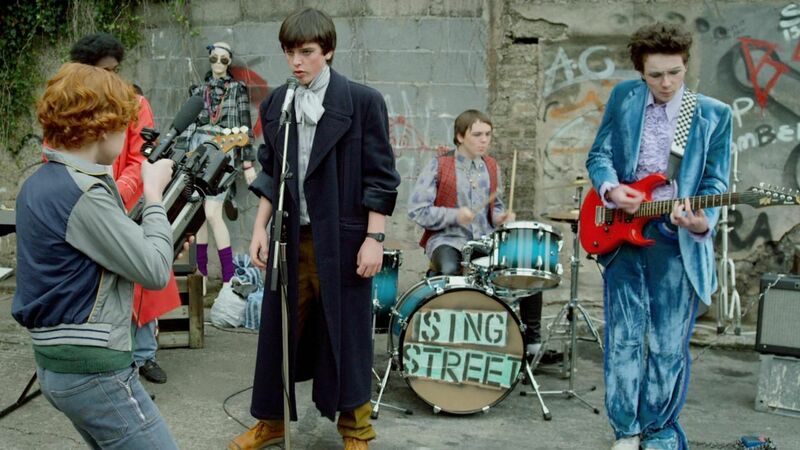 I highly recommend you checking 'Sing Street' out! 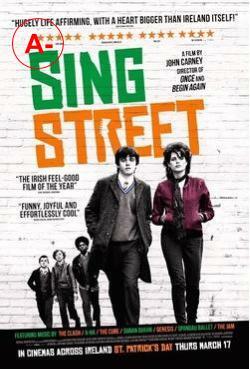 So have you seen 'Sing Street'? If so what did you think of it? If you are planning on seeing this film, I hope this review helped make your decision. Once again thank you for reading, it is much appreciated!